Q: Who will be tasked with cleaning my panes? A: Your panes will be washed by a team of certified and background-checked window cleaning adepts. Q: What services does window cleaning Brownswood cover? A: The experts will perform exterior window cleaning with the help of modern water-fed pole equipment on the market. For premises above the fourth storey, we'll send in practiced climbers for rope access window cleaning. For inside pane polish, the team will employ standard ladders and squeegees. Q: Can you still remove smeared dirt on a cloudy day? A: A few of raindrops won't sabotage the Brownswood window cleaners' work – rainwater is usually mud-free. However, if we face a rainstorm, then we will kindly ask you to hold off your booking for another day. A: As long as the team can walk past your front gate, they can blast away all muddy streaks without you having to be around. If your panes need a proper inside polish as well, then we'll arrange a quick key pick-up and delivery service. A: Usually, the distilled water container inside the team's washing caravan is always full. In case the tank is empty and with your approval, the specialists can easily connect the water-fed pole to any unoccupied water source. A: Once we tell you that the team's on their way, you'll need to make sure that they can enter your domain unimpeded. In addition, the cleaners will need a parking space within 30 metres from your property and on the same side of the panes you want polished. With the intuitive water-fed pole equipment, the professionals can help you outclass your competition at fair rates. And you can press down our window cleaning Brownswood rates even further by mixing two or more of our washing services together! To find out the exact numbers behind our price offers, make sure to stop by our handy price table below. 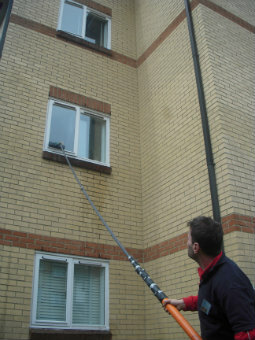 With window cleaning in Brownswood, you can quickly remove old blemishes from any commercial or residential property. Continue reading to learn how. To clean your windows' exterior side, the experienced window cleaners in Brownswood will deploy a new cleaning gadget – a water-fed pole that runs on distilled water. The cleaning tool's considerable reach (22 metres) allows the adepts to chase away muddy streaks from any four-storey premises without using ladders or unpleasant detergents. To tackle stains on high properties, we've come up with a wholly different cleaning method – the rope access window cleaning. After assessing your property's size and placement, a team of proven abseilers will either use ropes or ladders and squeegees to reinstate the former glory of your casements. We always organise each session beforehand to avoid incidents and can give you all the necessary COSHH records upon request. As our customer base grew in numbers, we widened our window cleaning in Brownswood to include other London regions as well. Please refer to our handy list to discover which close by locations we work with. Another quick and easy way to get a free instant quote or to book window cleaning services Brownswood N4 is through our web site.